Nestling at the foot of a lush hill, surrounded by a heady scent of orange blossoms and lavender, Trullo Ca' del Fico is the ideal place to rejuvenate body and mind from everyday life. An oasis of peace created for people who love the colors, scents and sounds of nature. In the gardens you will find a wonderful variety of shrubs typical of the Mediterranean Coast and fruit trees that grow on the various terraces of the property. These trees offer delicious fruits and vegetables to our guests in every season: pomegranates in the autumn, “corbezzoli” in December, citrus fruits in the winter and into the spring, summer figs. 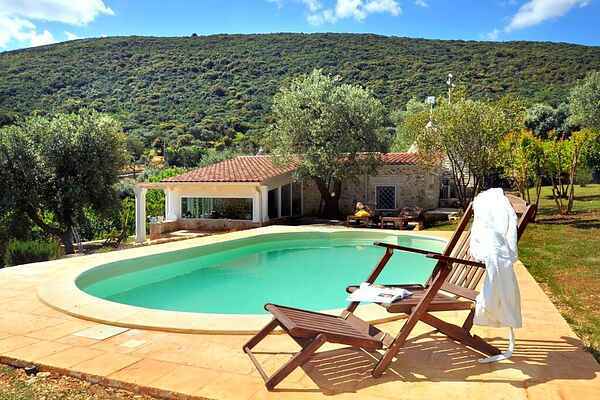 The swimming pool, surrounded by white pebbles and lavender plants, can been found to the left of the entrance porch, in a dominant position with magnificent view of the verdant valley extending all the way to the Adriatic coast. The sun terraces around the pool easily accommodate three or four loungers for relaxing or energizing massages. The town of Monopoli and the nearest beaches are only 7km away but you will not be tempted to leave your villa paradise much once you have arrived! Just 3km away lies Contrada “L’Assunta”, a small village offering basic amenities and a particularly famous bakery with a wide selection of crispy bread products and fragrant pastries. All this, together with the technology that accompanies the house (Wi-Fi, air conditioning and heating) and the absolute privacy and safety of this small and charming residence will make your stay memorable and unparalleled!